The artist James Abbott Whistler, known from 1881 as James McNeill Whistler, was born in Lowell, Massachusetts. His parents were George Washington Whistler, civil engineer, and his second wife, Anna Matilda McNeill. G. W. Whistler's work took the family to Russia from 1843 to 1848. The young James Whistler studied art with a student, A. O. Koritskii, and at the Imperial Academy of Fine Arts in St Petersburg. While convalescing from illness, he looked at a book of Hogarth engravings that made a lasting impression on him. In London, he saw Raphael cartoons at Hampton Court and Rembrandt etchings owned by his brother-in-law, Francis Seymour Haden. After his father's death in 1849, the family returned to America. In 1851, Whistler entered the United States Military Academy at West Point, studying art under Robert W. Weir. Lessons included copying from European engravings in the West Point collection, and topographical drawing, at which he excelled, but deficiencies in chemistry and discipline led to his expulsion in 1854. An interlude in the drawing division of the U.S. Coast and Geodetic Survey, Washington, DC, provided training in etching, the basis of his future career. In 1855 he sailed for Europe to study art, and, while remaining an American citizen, never returned. He attended classes at the Ecole Impériale et Spéciale de Dessin in Paris, and worked briefly in the studio of the Swiss painter, Charles Gleyre. He visited the Art Treasures Exhibition in Manchester in 1857, forming a life-long passion for the Dutch masters and Velázquez. He copied paintings in the Musée du Louvre, where he met Alphonse Legros and Henri Fantin-Latour. Through Fantin, he entered the circle of Gustave Courbet, leader of the Realists. His first important painting, At the Piano (YMSM 24), a portrait of his half-sister Deborah Haden and her daughter, was rejected at the Salon in 1859, but admired by Courbet. In August 1858 a tour of northern France, Luxembourg and the Rhineland resulted in his first set of etchings, Twelve Etchings from Nature, and his etchings were hung at the Salon and Royal Academy in the following year. The success of the 'French Set' encouraged Whistler to move to London, where he began twelve etchings of the river. In 1862 Baudelaire praised the depiction of contemporary city life in the 'Thames Set'. It was published in 1871, establishing Whistler at the forefront of the Etching Revival. However, his love of colour, fame, and money, drew him to painting. A realistic oil, La Mère Gérard (YMSM 26), was his first Royal Academy exhibit, in 1861. It was followed in 1862 by The Coast of Brittany (YMSM 37), painted from nature, with a lighter range of colour and thinner paint. A Thames-side conversation piece, Wapping (YMSM 35), started in 1861, was exhibited successfully at the Royal Academy in 1864. Bought by Thomas Winans of Baltimore, it was one of the first Whistlers exhibited in New York, in 1866. The model was his red-haired Irish mistress, Joanna Hiffernan, who had posed in Paris in 1861 for 'The White Girl', later called Symphony in White, No. 1: The White Girl (YMSM 38). Rejected by the Royal Academy in 1862, it hung in a small London gallery. In the first of many published letters, Whistler denied that it represented Wilkie Collins's 'Woman in White' but ‘simply represents a girl dressed in white in front of a white curtain' (Athenaeum, 5 July 1862). Rejected also by the Paris Salon in 1863, it was, with Manet's Déjeuner sur l'herbe, the 'succès de scandale' of the Salon des Refusés. Paul Mantz in the Gazette des beaux-arts (July 1863) called it a 'Symphonie du blanc'. Whistler adopted this nomenclature publicly for Symphony in White, No. 3 (YMSM 61) at the Royal Academy in 1867. In 1863 Whistler moved to Lindsey Row, on the Thames in Chelsea, where neighbours included the Pre-Raphaelite, D. G. Rossetti. He maintained contact with the continent, introducing the poet Algernon Swinburne to Manet; travelling with Legros to Amsterdam in 1863 to see the Rembrandts; posing with Manet and Baudelaire for Fantin's Hommage à Delacroix in 1864; and working with Courbet at Trouville in 1865. In 1866, avoiding family and political problems (the arrest of a friend, the Irish activist, John O'Leary) he travelled to Valparaiso, painting seascapes, including Crepuscule in Flesh Colour and Green: Valparaiso (YMSM 73). In 1865, when the Symphony in White, No. 2: The Little White Girl (YMSM 52) was exhibited at the Royal Academy, Whistler met Albert Moore, and together they explored the ideals of 'Art for Art's sake'. Whistler, wishing that he had been a pupil of Ingres, began a series of drawings and paintings of classically draped women and flowers on a musical theme, known as the 'Six Projects' – though there are actually five (YMSM 82 et seq.). They were commissioned by the ship-owner, F. R. Leyland, who also bought La Princesse du pays de la porcelaine (YMSM 50), one of several oriental subjects incorporating items from Whistler's collection of porcelain. Questions raised about his conspicuous signature led Whistler in 1869 to develop a butterfly monogram, based on his initials ‘JW’. After 1870, he abandoned the ‘Projects' for river-scapes, thinly painted in ribbon-like brush-strokes and watercolour-like washes, where detail was subordinated to mood and mass. It was Leyland who in 1871 suggested the title 'Nocturnes' for such 'moonlights' as Nocturne: Blue and Silver – Chelsea (YMSM 103). In 1871 Whistler painted a deeply felt portrait of his mother, restrained in colour and severe in composition. In 1872 this Arrangement in Grey and Black: Portrait of the Painter's Mother (YMSM 101) barely escaped rejection at the Royal Academy. It was the last painting he exhibited there, yet it entered the Musée du Luxembourg twenty years later and became one of the most famous of American portraits. Seeing it, the Scottish historian Thomas Carlyle agreed to pose for Arrangement in Grey and Black, No. 2: Portrait of Thomas Carlyle (YMSM 137), a powerful psychological study. 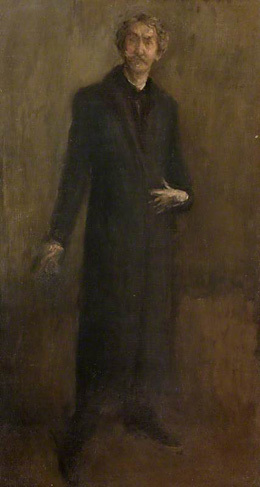 It was the first of Whistler's paintings to enter a public collection, in Glasgow, Scotland. The artist had parted from Joanna Hiffernan, but she and her sister Agnes helped raise his illegitimate son, Charles Hanson, born in 1870. As chief model and mistress she was replaced by the young Maud Franklin, who first stood in for Mrs Leyland for Symphony in Flesh Colour and Pink: Portrait of Mrs Frances Leyland (YMSM 106) where every decorative detail, from rug to dress, was designed by the artist. In 1874 Leyland backed Whistler’s first one-man exhibition, at a Pall Mall gallery, where these portraits hung with etchings and pastels in a harmonious setting. Whistler worked on a decorative scheme for Leyland's London house at 49 Princes Gate from 1876-1877. The dining room was transformed into an all-embracing Harmony in Blue and Gold: The Peacock Room (YMSM 178) based on peacock motifs, but far exceeding the owner’s wishes. Leyland refused to pay more than half the 2000 guineas asked by Whistler, and the artist lost a patron. Whistler collaborated with the architect Edward W. Godwin on a stand, Harmony in Yellow and Gold: The Butterfly Cabinet (YMSM 195) at the Paris Exposition Universelle in 1878, and commissioned Godwin to design the 'White House' for him in Tite Street. As costs escalated, he pursued a lavish life-style, entertaining guests to 'Sunday breakfasts', and becoming known as a dandy and wit. The influential art critic, John Ruskin, had singled out Nocturne in Black and Gold: The Falling Rocket (YMSM 170) at the Grosvenor Gallery, writing that he 'never expected to hear a coxcomb ask two hundred guineas for flinging a pot of paint in the public's face' (Fors Clavigera, 2 July 1877). In the ensuing libel case, Whistler justified the price: 'I ask it for the knowledge I have gained in the work of a lifetime.' He won the case, but was awarded derisory damages without costs. He then published Whistler v. Ruskin: Art and Art Critics, dedicated to Albert Moore (who had appeared in his defence), the first in a series of brown paper pamphlets, in December 1878. Whistler's financial position was serious. The birth of a daughter to Maud Franklin in February 1879 compounded domestic problems. To raise money he published etchings and lithographs, and a few mezzotint reproductions of his portraits. He painted expressive watercolours of Nankin porcelain for a catalogue of Sir Henry Thompson's collection (1878). None of these measures sufficed. In May 1879 he was declared bankrupt. His work, his collections, and his house were sold at auction. With a commission from the London art dealers, the Fine Art Society, for a set of twelve etchings, he left for Venice. He stayed over a year, producing 50 etchings and over 90 pastels of back streets and canals, bead-stringers and gondoliers. He joined the American artist Frank Duveneck and his students in the Casa Jankowitz, and worked on etchings with Otto Bacher. His etchings were distinguished by a delicate combination of etching and drypoint lines with a surface tone of ink, producing effects akin to monotype. In pastels such as Calle San Trovaso, Venice (M775) the subject was vignetted, the brown paper setting off expressive line and jewel-like colours. These pastels had considerable influence on the Americans, particularly J. H. Twachtman, and on the Society of American Painters in Pastel founded in 1882. Exhibited at the Fine Art Society in 1881, framed in three shades of gold, and with the room decorated in reddish-brown, greenish-yellow and gold, Whistler’s pastels were extensively reviewed. The etchings were shown in London in 1880, arousing considerable discussion on Whistler's technique and subject matter. A further selection was shown in 1883, both in London and at Wunderlich's in New York, in an 'Arrangement in White and Yellow' which greatly influenced later exhibition design. The catalogue, designed by Whistler, maliciously quoted earlier press reviews. The first Venice set, of twelve etchings, was published in 1880, and the second, 26 etchings, was published by Messrs Dowdeswell in 1886. Whistler etched but never published several later sets, including a 'Jubilee Set' and an 'East London Set' in 1887, a 'Renaissance Set' in France in 1888, and an Amsterdam set in 1889. He travelled widely in England and Continental Europe, and his work was exhibited in Europe and America. The first watercolour he exhibited in New York, at the Pedestal Fund Art Loan Exhibition in 1883, was Snow (M877a), painted in Amsterdam in 1882. In 1884 he painted seascapes in St Ives with his pupils, the Australian born Mortimer Menpes, and the English Walter Sickert. In 1885 he was in Holland arguing with W. M. Chase. Watercolours like Variations in Violet and Grey – Market Place, Dieppe (M1024) were shown beside those of the Impressionists at the Galerie Georges Petit, in Paris, in 1883 and 1887. He oscillated between London and Paris, with lengthy stays on coastal towns in France and England. In 1901 he filled books with sketches of Algiers and Corsica, and carried out his last etchings, in the streets of Ajaccio. Whistler alternated between small paintings, about 12 x 20 cm (5 x 8") in size, and full-length portraits of actresses and aristocrats, children and collectors, friends and family. Manet introduced him to the art critic Théodore Duret, who agreed to pose, as an experiment, in modern evening dress, carrying (for colour's sake) a pink cloak, for Arrangement en couleur chair et noir: Portrait de Théodore Duret (YMSM 252). Duret mediated between the artist and the aristocratic Lady Archibald Campbell, and thus ensured the completion of Arrangement in Black: La Dame au brodequin jaune – Portrait of Lady Archibald Campbell (YMSM 242), shown in the Chicago Columbian Exhibition in 1893. Arrangement in Black: Portrait of Señor Pablo de Sarasate (YMSM 315), showing the violinist on stage, was exhibited in London, Hamburg, Paris, and finally, in 1896, Pittsburgh, where it was bought by the Carnegie Institute, the first American public collection to acquire his work. Exhibiting at International exhibitions in Antwerp, Brussels, Paris, Munich, in Chicago and Philadelphia, in Dublin, Glasgow and St. Petersburg, Whistler gained medals and honours. In 1885 he delivered the 'Ten O'Clock' lecture in Prince's Hall, London, an eloquent exposition of his views on art and artists, which was published in 1888. The poet Stéphane Mallarmé translated it into French and introduced Whistler to the Symbolist circle in Paris. Extensive correspondence and subjects like Purple and Gold: Phryne the Superb! – Builder of Temples (YMSM 490) document their growing friendship. In 1886, the Society of British Artists in London, in need of rejuvenation, risked electing Whistler as President. He set out autocratically to reform the Society, raising money, revamping the galleries, designing a Velarium (M1122) to soften the light and direct it on the pictures, rejecting sub-standard pictures, and inviting foreigners (like Waldo Storey, Alfred Stevens and Claude Monet) to exhibit. The Society revolted, and he was forced to resign. Meanwhile, pastels, oils, drawings and watercolours – like the atmospheric Nocturne in Grey and Gold – Piccadilly (M862) – hung in three one-man exhibitions of 'Notes' – 'Harmonies' – 'Nocturnes' at Messrs Dowdeswells in 1884 and 1886 and at Wunderlich's in New York in 1889. This gave Americans, like Howard Mansfield, Howard Whittemore, and Charles L. Freer, the opportunity to buy their first Whistlers. They flocked to his studio and competed in buying his work: Freer formed the greatest of all collections of Whistler’s work in America. In 1888, Whistler married Beatrice Philip, widow of E. W. Godwin. On honeymoon, Whistler taught her to etch. An artist and designer, she worked beside him, and her work has sometimes been mistaken for his. She encouraged his pastels of young models, like the Pettigrew sisters, and his print-making. She posed for several portraits including Harmony in Red: Lamplight (YMSM 253). Some of his finest lithographs, like The Duet of 1894, show Beatrice at home in 110 rue du Bac in Paris. The most poignant, By the Balcony and The Siesta, were drawn as she lay dying of cancer in 1895. She died in the following year, and her young sister, Rosalind Birnie Philip, became Whistler's ward (as well as model and companion) and inherited his estate, giving and at last bequeathing a major collection of Whistler’s work to the University of Glasgow. Whistler's collection of letters and pamphlets on art, The Gentle Art of Making Enemies, was published by William Heinemann in 1890. Whistler's butterflies, a sting in their tails, decorate each document. Another book – Eden versus Whistler: The Baronet and the Butterfly. A Valentine with a Verdict, published in Paris by Louis-Henry May in 1899 – recorded a lawsuit brought by the artist against Sir William Eden in 1898, which resulted in a change to French law, by giving artists control over their work. In 1896 Whistler was elected first President of the International Society of Sculptors, Painters and Gravers. Joseph Pennell, Whistler's friend and future biographer, and the artist John Lavery, were active committee members. Independent artists from Europe and America were invited to send work to their exhibitions, in 1898, 1899 and 1900, but Academicians were discouraged. The exhibitions were sparely hung, coherent and effective. Whistler's own exhibits were modest, fluidly painted panels like Green and Silver: The Great Sea (YMSM 518), and severely geometrical shop fronts like Gold and Orange: The Neighbours (YMSM 423). His last portraits, of Freer, George W. Vanderbilt, and the gambler Richard A. Canfield, and of a young red-haired model, Dorothy Seton, were painted with the forceful brushwork and thin skin of paint, the strong characterisation and subtle colour, which characterised his work. In his late self-portrait, Brown and Gold (YMSM 440), the pose was based on Velázquez's portrait of Pablo de Valladolid in the Prado. In 1900 Brown and Gold hung in the American section of the Paris Universal Exposition, but he continued to rework it until his death. Painted with nervous flickering brushwork, serious and introspective, it is a deeply moving work. Whistler died in London on 17 July 1903. 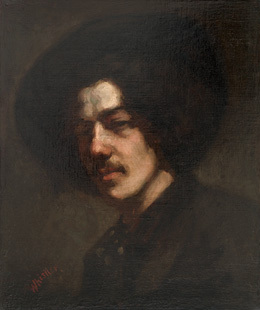 Portrait of Whistler with Hat, 1857/1859, Freer Gallery of Art, Washington, DC.